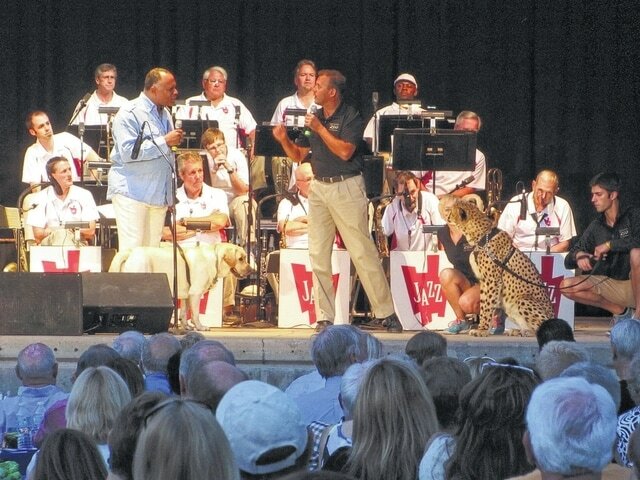 Columbus Jazz Orchestra artistic director Byron Stripling (left, standing) learns from Columbus Zoo CEO Tom Stalf how a dog and a cheetah have become friends during a past JazZoo concert, as the rest of the big band looks on. The 10th season of “JazZoo” begins Friday at the Columbus Zoo and Aquarium. The annual concert series brings the Columbus Jazz Orchestra, which normally performs indoors at the Southern Theatre in downtown Columbus, outdoors to the Water’s Edge theater near the Scioto River in Powell. “It seems like we get a lot of people who consistently come each year, and they talk about it every year,” said Julia Galgon, spokeswoman for the orchestra. For those who haven’t attended, here’s how the family-friendly shows typically play out: People may bring in their own food and drink or purchase some at the venue. Doors open at 6:30 p.m. (if you wish to visit the zoo, arrive as early as 9 a.m.). Upon entry to the zoo, they can walk or take a shuttle to the concert site. The shows begin at 8 p.m. (after zoo hours) and run about two hours, with an intermission, rain or shine (bring an umbrella). After a few tunes, zoo staff bring out a few of the animals on view and describe their behavior to artistic director Byron Stripling. • “Hello Dolly — Music From Broadway and the Silver Screen” (July 10): Guest vocalist Carly Thomas Smith, whom Stripling said “blew the roof off” the Southern in her first appearance, returns to sing Barbra Streisand, James Bond themes and other well-known works. • “Basie, Duke & the Big Bands” (July 17): Guest clarinetist Ken Peplowski returns for a concert of works from the bands of Duke Ellington, Count Basie and Stan Kenton. “He’s known as a guy who plays a lot of Benny Goodman, but he’s so much bigger than that,” Stripling said. • “Ella, Louis & All That Jazz” (July 31): Australian vocalist/bassist Nicki Parrott makes her CJO debut. “She’s easy to work with, knows everything, is a complete musician,” Stripling said of her. Expect to hear songs made popular by Louis Armstrong, Ella Fitzgerald and great jazz vocalists. • “Smooth Crooners: Nat King Cole and Beyond (Aug. 7): Canadian singer Denzel Sinclaire makes his CJO debut with standards made popular by artists as diverse as Billy Eckstine and Willie Nelson. “There’s something almost spiritual about him, the way he delivers a song,” Stripling said. For tickets or more information, call 614-294-5200, Ext. 110, or 614-724-3485.